This is a card that was underrated and under the radar in 2005. Some players sided 1 copy of it and that’s it. However, in modern play of Goat Format, especially with the agreement of banning Exarion Universe, Asura Priest is now more common as the Scapegoat counter. * It’s a LIGHT for BLS Envoy, of course. * This card is a beater that returns to your hand before the opponent can punish it. While, in some respects, this is a downside, it also means it’s much harder to get rid of. It can’t be minused in battle since you choose the engagements. * It allows you to commit less resources on the board than your opponent. This means you can protect your life points with cards like Scapegoat and let your opponent overextend instead of you. * If the opponent has a bad enough hand, Asura Priest can even force the opponent into taking 3400, or even 5100 damage, in some cases. * To protect their life points and their Scapegoat tokens, Asura Priest may force the opponent to use traps like Sakuretsu Armor and Ring of Destruction that they may have wanted to save for a more powerful monster like Airknight. * Against Chaos decks, it gets over their flip effects without being vulnerable to Chaos Sorcerer. Against Recruiter Chaos decks, it can diminish the defensive and offensive capabilities of recruiter cards like Mystic Tomato and Shining Angel. * For decks with recruiters cards, Asura is a beater that can get out of the way when needed so that only your recruiters (the monsters you want to be attacked) are viable attack targets. * It’s a Spirit monster, so it’s useless for Premature Burial and Call of the Haunted. Consider that your deck will likely already have 2 non-revivable Spirit monsters with Tsukuyomi’s, and Asura tests Murphy’s Law even more so. Having a dead Premature/Call is just another thing that can go wrong. * It’s terrible against Zoo/Aggro decks. It relies on battling in order to gain value, yet those decks have plenty of battle traps. Those decks also don’t have many monsters weak to it, they have a lot of monsters that Asura just can’t topple in battle and lastly, Asura returning to your hand puts you at even more of a summon disadvantage. * If you are running a Zoo/Aggro deck yourself, Asura is not ideal because, while it can be quite aggressive, it also prevents you from building up a swarm of monsters by requiring you to constantly Normal Summon it. 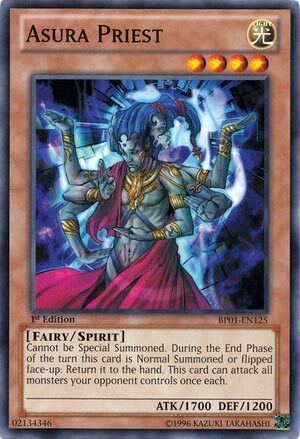 * For decks that capitalize on flip effects and Tsukuyomi, like Chaos, Asura takes up a Normal Summon you could be using on setting flip effects or summoning Tsukuyomi. * It’s not a reliable counter against Scapegoat. The opponent can just chain Scapegoat during your End Phase after you’ve used Asura Priest. Mainly, it’s hard for Asura to go and kill all 4 Goat tokens because most opponent’s expect it nowadays. How many copies of Asura should you run? Never 3. That can be redundant if it returns to your hand. If you’re expecting your opponents to be using a lot of Goat Control and Chaos decks, main decking two copies can be viable. However, using 2 Asura could be a game 1 loss if you face Zoo (or another deck that isn’t fazed by it). At the moment, I’m personally leaning toward main decking 1 Asura Priest and side-decking another copy. This way, I always have Asura as an option for when I need it, but I wouldn’t want to personally run 4 Spirit monsters if I’m not sure I’ll be facing a deck that’s weak to Asura. In sub-optimal matchups, can add in the 2nd copy to punish some decks, yet risk is minimized by only maining 1 copy. Some players may not want to main or side any. That’s their choice: there’s a variety of different tech options in this format, depending on your preference and playstyle. Myself, I think Asura Priest is important for a format that depends on you being able to commit and un-commit resources at your own discretion. However, Murphy’s Law is still a factor.